Join Apron Strings author Jan Wong for a special author talk on Friday, March 9, 2:00PM at the Dr. Sun Yat-Sen Classical Chinese Garden in Vancouver, BC. Jan Wong knows food is better when shared, so when she set out to write a book about home cooking in France, Italy, and China, she asked her 22-year-old son, Sam, to join her. On their journey, Jan and Sam lived and cooked with locals, seeing first-hand how globalization is changing food, families, and cultures. Along the way, mother and son explored their sometimes-fraught relationship, uniting — and occasionally clashing — over their mutual love of cooking. 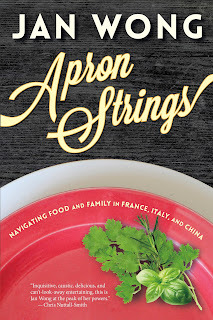 A memoir about family, an exploration of the globalization of food cultures, and a meditation on the complicated relationships between mothers and sons, Apron Strings is complex, unpredictable, and unexpectedly hilarious. This event is in partnership with the Dr. Sun Yat-Sen Classical Chinese Garden and the Asian Canadian Writers’ Workshop. Please visit the Garden website at www.vancouverchinesegarden.com for more details on how to attend this event. Books will be available for purchase. still in print.) She has won numerous journalism awards and is now a professor of journalism at St.
Jan Wong is available for comment and interview. For review copies, permission to reprint excerpts, or interviews with the author, please contact Jeff Arbeau at publicity@gooselane.com or 1.888.926.8377. For additional information on the book, author events or the publisher, visit www.gooselane.com. For more information about the author, visit www.janwong.ca.